03 | November | 2014 | Through the seasons before us..
It’s programmed into us seemingly, whether it’s the latest TV show to download, the latest album, the latest gadget to buy – facilitated ably by some kind of credit – we want it all, and we want it now. I’m no better than anyone else really, I like to have the latest shiny thing, and certainly when we found ourselves atop the league table after a few games I instantly re-evaluated my more conservative pre-season aspirations in favour of something more grand. That is the natural human thing to do. Of course, quite a lot has happened since I last posted on here… (understatement!) – you only have to look at the site header or check the date on the post before this – we’ve had the joys of Eck, the return of the Wee Yin, a shambolic caretakership and the return of a legend to contend with, and it’s been tempting a few times along the way to log back in. I’m not sure how frequently the urge will take me now, but listening to Matchtalk on the way home and skimming the forums and social media as I do there was that irresistible pull to try to remember how on earth to log in to the blog and post something (and check the email account for the first time in aeons – sorry about that if you dropped me a line!). Before the season started I was ready to accept a steady build – ideally a play-off or better finish but possibly less, this is the Championship, it’s a competitive league after all. And whilst I howl with anguish along with other fans as the early season promise (in results terms at least) seems to be falling away from us, I’ve decided in more rational moments to stick by that objective. There is absolutely no denying that no wins from nine games is poor, and that even with the injuries (bloody injuries again!) we have, we should have enough in our locker to have picked up more points. Furthermore, I don’t think it’s unreasonable to observe that in games where we have picked up points we might be considered fortunate to have done so. However, we are also a work in progress – sure, we have acquired what I think are some exceptional players for this level over the summer, the cherry on the top of an FFP defying swoop for Britt Assombalonga I must admit did perhaps start to edge me to hoping for more than my ‘sniffing around the play-offs’ evaluation prior to his arrival – but even so, I still think it’s realistic. I do worry that sometimes we seem to lack a gameplan, that seemingly we lack cohesion in defence, creativity in midfield and a cutting edge up front – and a relatively inexperienced manager (operating at this level at least) whose legendary status means that even reasoned criticism will inevitable cause embittered and often embarrassing divides amongst the fans. Which is really why we need to be better than that. And generally we are – the fans that travelled to Huddersfield in such numbers did a sterling job of staying behind the time even when there was no hope of getting anything from the game, and we need to see more of that – since the reclamation (or really clamation since it’s been an away area since pretty much day one) of the Lower Bridgford end has really improved the atmosphere at the City Ground too. The principal problem we face now is – familiarly – the identity of the injured players we have. Whoever partners him in defence plays ten times better when Hobbs is in the side – and he’s a leader. There is no player in the league with the vision and passing range of Andy Reid – and he’s a leader. Our talisman and midfield dynamo (or indeed, left back since that area seems so troublesome) in Chris Cohen is also a leader. So it’s kind of understandable that when we’ve hit a sticky patch as we have that that lack of on-field leadership is costing us because the players aren’t confident, and nobody seems to be ready to step up. I’d really hoped that Mancienne or Lansbury might’ve taken on the mantle but the former appears to have let his head drop a fraction, whilst Henri has too often been a passenger. As for Pearce, it’s far too early to be suggesting he should resign or be sacked for me – and that’s not just because I’ve idolised the man since my childhood, it’s because he needs time to sort out the problems, you can’t tell me he isn’t even now agonising over how best to turn our fortunes around – and whilst I can’t categorically say that he will succeed, I do think he deserves more of a chance to finish the work he has started here. I still think Sean O’Driscoll’s removal was untimely – whilst I buy into the criticism he received, he was planning for sustainability, of course, he might have failed – nobody has a crystal ball, but certainly I think he’d have done better than McLeish went on to do – and without the fireworks and drama that seemed to me the inevitable conclusion to the ‘Unfinished Business’ saga which was doomed to failure. The best comparison I can make is with Leicester City – sections of their fans called for Nigel Pearson’s head whilst he was still sorting out their club, and look at them now. People point to Derby too but they’re a year ahead in their squad development than we are, we have some way to go – and a wholesale change of manager, coaching staff, vision and probably a raft of playing staff is only going to see is back at the start of a new journey – rather than a the few months we have into this one. Instant gratification sure is a compelling compulsion – we all fall for it, we get carried away after shakily hanging on to top spot for a while. It’s a psychological blow to have fleetingly ascended to where you want to be only to tumble down the league again – but it’s still relatively early, the league is still as tight as the proverbial gnat’s chuff, and if we can stay united behind the manager and owner who – for now at least – still seem to be on the same page – it seems to me that can only expedite a recovery on the field. 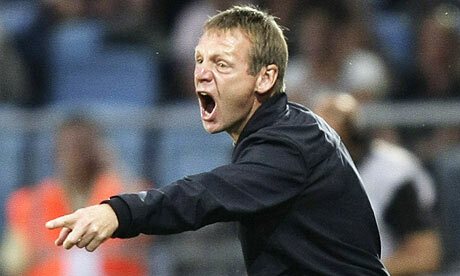 I can’t honestly hand on heart say that I think Stuart Pearce will ultimately lead us to the promised land – when he was announced as manager I was a little disappointed because I didn’t want the hero of my childhood to be diminished in what has proven to be a shaky position at best – but I do believe that he deserves more than a few months before being cast upon the metaphorical scrap heap.